Hello there, today I have a thank you card to share with you. The recipient, Kim Dellow, uses lots of different mediums in her work and so I wanted to incorporate one in to my card for her. 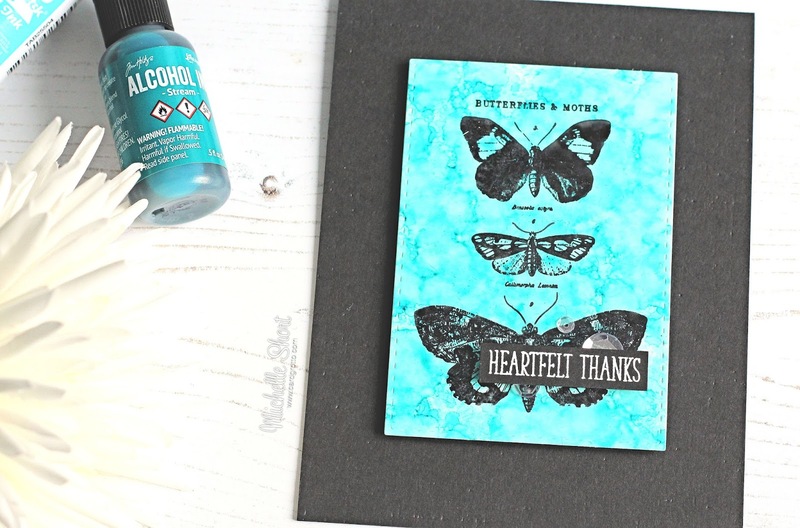 I decided to go with Alcohol Inks to create a background for the Tim Holtz butterflies. I started off by taking a piece of Yupo paper. Using an Alcohol Ink Applicator, I pounced alcohol inks in Aqua, Pool and Stream on to it. I really like the texture the alcohol inks create on Yupo. 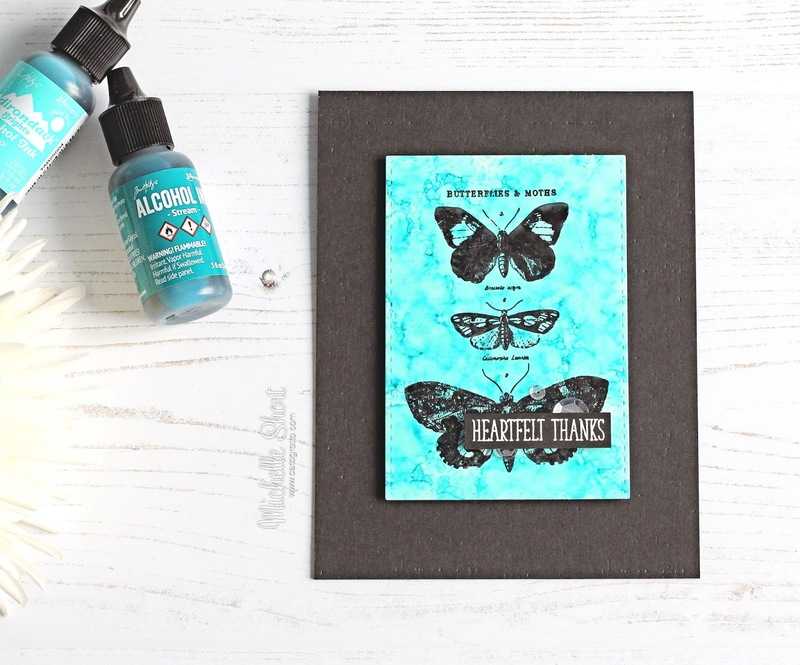 I took one of the butterfly images from the Tim Holtz Papillion set and stamped this on to the Yupo paper using Black Soot Archival Ink. I then cut the Yupo paper down using a SSS Stitched Rectangle die. I took a black A2 card base and embossed it using the PTI Linen Embossing Plate to give some added texture. The butterfly piece was then added to it using black foam and DST. The sentiment, from the Clearly Besotted Many Mini Messages set, was stamped in Versamark and heat set with white embossing powder. This was cut in to a strip and added to the card with more foam. To finish off, I added a few PPP Sparkling Clear sequins. This is definitely one of those cards that looks better in real life than in the photos! I love the pop of aqua against the black card base. Thanks so much for visiting me today, I hope you have a great day! Very different style of card for you, Michelle, but I love it! Love the layered stamps, always wanted to try them! Thanks for the ideas. I am a huge fan of various shades of blues; great contrast with the black butterflies.